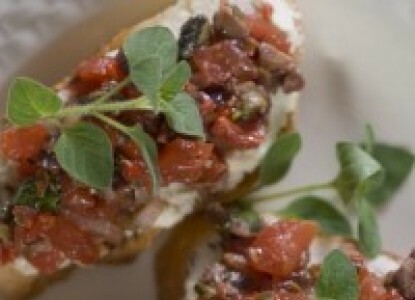 Featured in the June, 2010 issue of NH to Do Magazine’s article on the Inn to Inn Herb Tour, this recipe is a wonderful summer appetizer that blends the flavors of Greece and Italy- that’s why we call it Ionian Bruschetta! Two hours before serving: Infuse 2 tablespoons of oregano in 1/4 cup olive oil. Let stand at room temperature. Prepare ricotta spread by whisking together ricotta and Parmesan cheeses, olive oil, and cream until light and fluffy. Season with salt and pepper. Cover and refrigerate until ready to serve. Dice roasted peppers. Combine tomatoes, 1 tablespoon olive oil, salt and pepper, shallots, olives, roasted peppers, garlic, capers, parsley, oregano, and red pepper flakes. Let stand at room temperature one to two hours. At serving time: Brush baguette slices with infused oregano oil and broil on both sides until toasted. Sprinkle with sea salt and freshly ground pepper. Spread ricotta mixture on each slice of baguette and top with tomato mixture. Garnish with sprigs of oregano.